The Redcar Bears mascot ‘Smoggy’ was so popular last season that plans are in place for a ‘Smoggy Cub Club’. 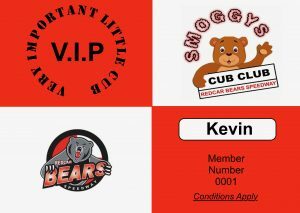 Our younger fans will have the opportunity to become a member of the ‘ Cub Club ‘which will entitle them to a limited edition ‘ Mini Smoggy Bear ‘ suitably dressed in club colours. They will be issued with a Cub Club Pass entitling them to access to the centre green to join in with the Smoggy Fun n Games at the interval. Other benefits will be Birthday Cards from their favourite rider ( or Smoggy!) as well as bonus prizes and competitions throughout the season with a member of the Cub Club being entered in the interval Fun Fair Game each week where they could win big prizes for their Family. Membership forms can be downloaded on the club web site here or collected at the track. The enrolment cost is £15 and anyone joining before 30th March will have the opportunity to be included in a team photograph on press and practice day. Next story Bears race jackets finished!